Farzaneh Mansouri's future data collectors are cruising around oceans worldwide, following blooms of productivity and accumulating decades of information—all in their earwax. Mansouri, an environmental scientist at Baylor University in Waco, Texas, studies the wax "earplugs" built up over years in sealed whale ear canals. The earplugs, according to her findings, provide records of the animals' movements and diets over the course of their long lives. Whales are known as ocean sentinels – the enormous mammals can tell researchers valuable information about the ocean environment—but are very difficult to study, said Sascha Usenko, an environmental chemist and senior researcher with Mansouri's project, who also works at Baylor University. Mansouri, Usenko and their colleagues have found a new way to access that information: analyzing whale earplugs, collected from dead whales over the past few decades and preserved as simple oddities in museum storerooms around the world. The researchers discovered the layers in whale earplugs contain time-specific layers of stable carbon and nitrogen isotopes. Those isotopes can show where whales traveled and what they fed on over decades. Mansouri presented the results of her work earlier this week at the 2017 American Geophysical Union Fall Meeting in New Orleans. "This research, in its own right, changes our understanding of foraging behavior," Usenko said. The new research also gives scientists insight into past ocean conditions. "These sorts of long-term databases are impossible to get for most animals," said Michael Polito, an ecologist from Louisiana State University in Baton Rouge who was not involved with Mansouri's research. "It's an amazing record." 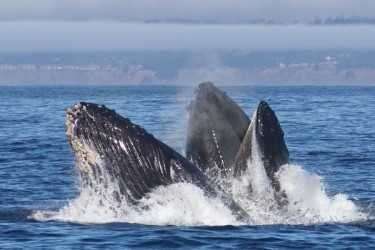 Whales like humpbacks, fins, blues and minkes are migratory. Every summer they swim toward their polar feeding grounds and excrete light-colored earwax. Dark-colored wax marks their journeys into warmer, more equatorial breeding grounds in the winter. Few animals are as long-lived and wide-ranging. As the years pass, these dark and light layers delineate whale movements through the world's oceans. Scientists in the early 1900s discovered they could read these layers like tree rings, counting a whale's age in its earwax, but went no further. "It's like a sediment core, or an ice core," Mansouri said. And modern scientists know core samples, whether they be from reefs, glaciers or even trees, can shelter enormous amounts of information. The researchers decided to dig in. 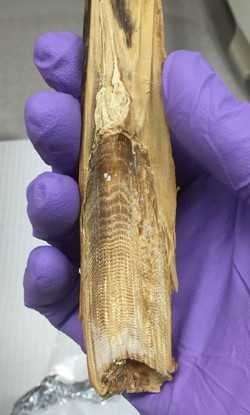 They sampled 20 earplugs from several whale species in the Atlantic and Pacific oceans, acquiring some from the Smithsonian Institution National Museum of Natural History in Washington, D.C. (which has stored over a thousand whale earplugs for more than fifty years) and others from the Natural History Museum in London. The researchers separated each delicate layer of earwax, made of an organic matrix of lipids, waxes, and keratin. They powdered the earwax and analyzed the ratios of different carbon and nitrogen isotopes in the lipids. The isotope ratios within the layers of a particular whale's earplug can be used as a timeline, showing stability or variability over the years of a whale's life. Carbon-13 concentrations are known to decrease with higher latitudes, so the profiles of that isotope can reveal how far away from the equator a particular whale might have traveled from year to year. Nitrogen-15 concentrations rise as you move up the food chain, so their profiles could reveal whales' dietary changes from year to year. For example, if whales were feeding on plankton, their nitrogen-15 levels should be lower than years in which they fed on plankton-eating fish. Some of the earplugs the researchers studied revealed relatively stable isotope concentrations for both carbon and nitrogen, indicating the whales likely gulped down the same types of foods in the same areas over many decades. Some, however, had less straightforward patterns of isotope concentration. Mansouri wondered if the group of whales whose levels of carbon-13 decreased steadily over several decades might have been driven north over time by an increase in global boat traffic or warming ocean surface temperatures. Stable nitrogen-15 content over time indicated some whales were likely feeding on the same type of food (blue whales, for example, specialize on oceanic plankton called krill), but with much more variability in their carbon-13, they must have been traveling more to find their food, Mansouri said. Mansouri and the team think their results are just the tip of the earwax. Mansouri and Usenko are excited about the potential of matching patterns in carbon-13 and nitrogen-15 isotopes to other events which might be recorded either in history or to other types of data collected from whale specimens. Hormones, for example, could indicate stressful periods in whales' lives. Mapping the incidence of stress alongside the particularly variable periods during a particular whale's lifespan might show a clearer picture of its reasons for changing food source or location. Pollutant levels, too, might clarify some of the isotope patterns, according to the researchers. World wars, the presence and absence of high-impact whaling and increased noise in the oceans over the last 250 years represent some of the dramatic oceanic changes potentially encoded in the earwax mass buried deep inside of a whale's skull, Usenko said.